You will be awakened in the morning why the wooshing sound of the first balloons up before sunrise and various aircraft circling the field – look out your window and see the bright colors of a few balloons in the dark sky that go up before the mass ascension to check out the conditions prior to launch. You may want to tune your AM radio to 770 to hear all the coverage. 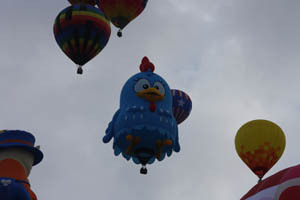 Prior to launch you will see many balloons glowing with their vibrant colors during the early morning balloon glow. When the ground crews get the all clear message walk over to the field where you will be right next to 100’s of balloons inflating and taking off into the sky – don’t forger to bring your camera – after a little while the sky will be littered by every imaginable shape and size balloon. 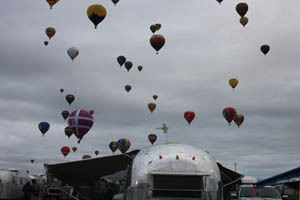 Of course you really don’t even have to leave your Airstream as the balloons will most likely come right over you. Watch for the bee’s, the cow the scary face and many many more special shapes. 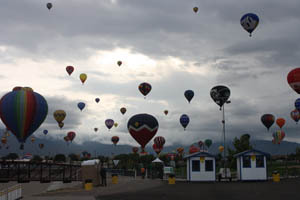 Once the balloons are gone – its time to walk over to the many vendors and check out their wares – have one of New Mexico’s famous breakfast burrito’s – yum yum – if you feel like it you can walk over to the chain saw carving at the north end of the field, or on Sunday check out the cool cars at the car show on the field – by this time it is mid to late morning and time to come back to your trailer to relax a bit – read the paper that is delivered to your trailer each morning, go check out the sites of Albuquerque, ride the tram, go for a drive – have a nice lunch – take a nap or just hang and visit with your neighbor and talk for hours about Airstreams and road trips. Be sure to look in the schedule in your packet for specific afternoon activities each day. In the afternoon, you will have plenty of time to take a stroll or do a nice bike ride on the bike path that goes right by our front door and goes all over the city – you can pretty much get anywhere by bike right from Balloon Fiesta park. Five o’clock its time for our meet and greet gathering and important announcements – bring food, drink and a friend or two and hang out with us – bring food for yourself or to share with others. 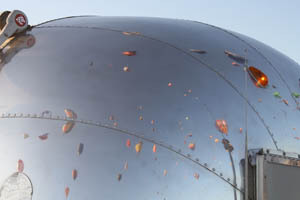 As the day comes to a close and the sky darkens – the balloons will light up again for balloon glow – many balloons will be on the ground lighting up in a spectacular display of colors. Then its time for fireworks! This is one of the best displays you will see – be sure to watch for a surprise at the west end of the field as the display wraps up. After fireworks its time to come back to camp and sit around the (propane) campfire and tell all kinds of true and untrue stories. At some point you will want to retire – or not – maybe even stay up all night and just look at the New Mexico sky, sit back and think about what a day it has been – but wait – tomorrow you get to do it all over again!